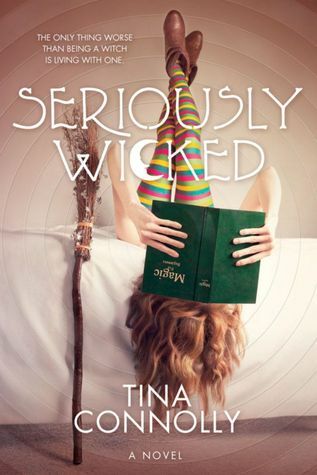 I want to preface this review by saying that I read Seriously Wicked immediately after reading another book that has a much darker take on YA Paranormal and I’m not entirely sure how much that influenced my thought process towards this book. Now, with that being said, I think the best word I can use to describe this book is “cute.” You know what I mean, like the perfectly sweet friend that has always been labeled “cute” rather than “beautiful/handsome” because his/her best friend is gorgeous. That kind of “cute.” It was a perfectly fine and pleasant read. I just never found myself getting too excited about what was going to happen. The main character, Cam, is a teenager stuck living with a wicked witch who took her from her parents when she was a baby. She is the errand girl for said wicked witch for everything from pig’s ears to rhubarb. If she doesn’t accomplish a task she is punished, in ridiculous yet creative ways. Cam is constantly trying to sabotage any and all plots by the witch to take over the city so when a demon is summoned…and then breaks free only to inhabit the cute new boy at school…well she has her work cut out for her if she wants to save…well everyone. I think that the characters just didn’t really do it for me in this book. I wanted more, plain and simple. My favorite character would have to be the dragon and she didn’t even talk. 3 quills to Seriously Wicked. Like I said, if you are looking for a “cute” little book about a teen NOT-wannabe witch that ends up in some quirky hijinks…well then this one is for you.